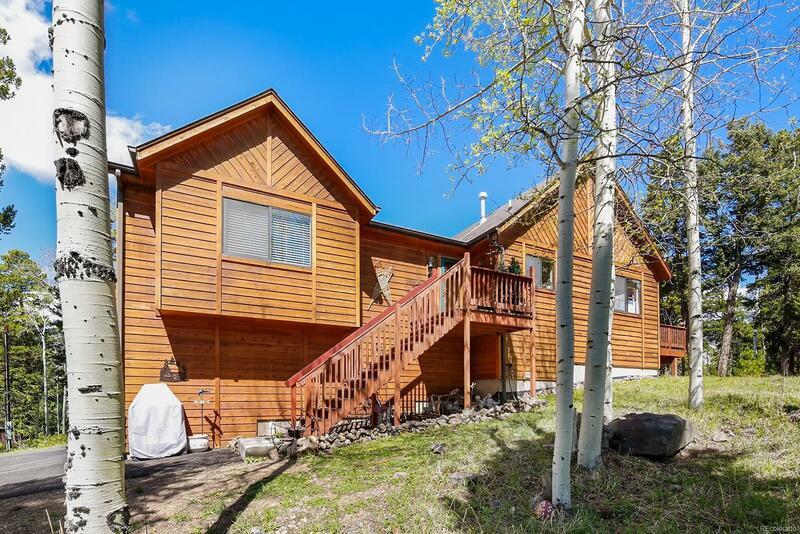 Stunning Retreat in excellent conditions with peak Rocky Mountain views in the heart of Conifer! Mountain living at it's finest in this contemporary home nestled by lush forest on 0.44 acres lot! Luminous open layout concept, beautiful log column and staircase, 13â6â ft cathedral ceiling with custom wood plank detail and stacked stone gas fireplace. Ample Kitchen with eat-in island and 42" cabinets. Walk out to the relaxing main deck and take in the breathtaking natural surroundings. Master Bedroom features French doors entry and walk-in closet. Unique 5-piece en-suite bath with corner soaking tub and forest views. Bright, finished garden level with 9âft+ ceilings, private Guest Bedroom, spacious Family/Rec area and Bath. Oversized 2-car garage with plenty of storage and/or workshop area. Just 10 minutes to downtown Conifer, restaurants and markets. Within 25 minutes to 470 and Red Rocks Amphitheater! Set up your private showing today!